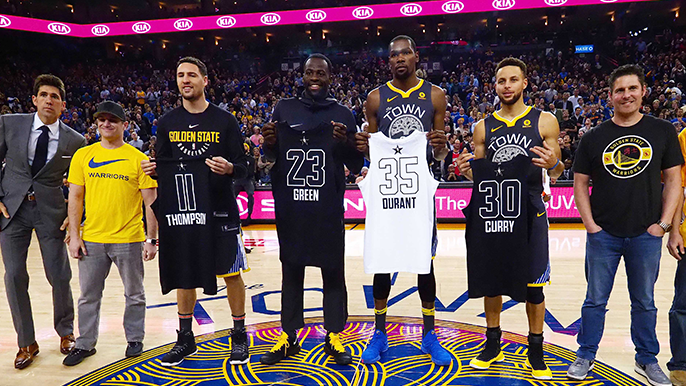 For the last three seasons the NBA’s All-Star game has featured at least three members of the Golden State Warriors. That number may stay the same this year, but for the first time during that stretch it looks like Draymond Green might be at home watching his teammates like everyone else. Thursday morning the NBA released the first round of fan voting for the All-Star game, which will be played in Charlotte, North Carolina later this season. Stephen Curry appears to be a lock for the starting lineup, leading the Western Conference backcourt voting by close to 100,000 votes. If the vote ended now Kevin Durant would also sneak into the starting squad along with LeBron James and Luka Doncic. Klay Thompson’s spot on the roster is in jeopardy along with Green. Thompson has made it to four straight All-Star appearances, but with the conference stacked with high-level guard play his spot isn’t written in stone just yet. Draymond Green checks in at nine on the list of Western Conference frontcourt players. This year he is averaging 7.3 points, 7.8 rebounds and 6.6 assists a game. Those are all respectable numbers, but the forward has also missed 14 games this year due to injury and suspension. A combined vote from the fans, media and players decide who the starters are for each conference. After that, the league’s coaching staffs will fill out the game’s reserves. For the second-straight year, the each conference’s leading vote-getter will be selected as their conference’s team captain. The team captains will then draft their team’s bench from the reserve players selected by the NBA coaches. Last year Stephen Curry and LeBron James were the team captains, but with James’ arrival in Los Angeles it looks like Curry will relinquish his spot as Western Conference captain. This season’s All-Star starters will be revealed on Jan. 24. The game’s bench players will be revealed a week later on the Jan. 31.